Congrats to Brothers Stephen Thomas and Brandon "Big Red" Yates who were raised to Master Masons last night! These Brothers have been working hard since they became EAs, both working on proficiencies and helping out the lodge with various functions. 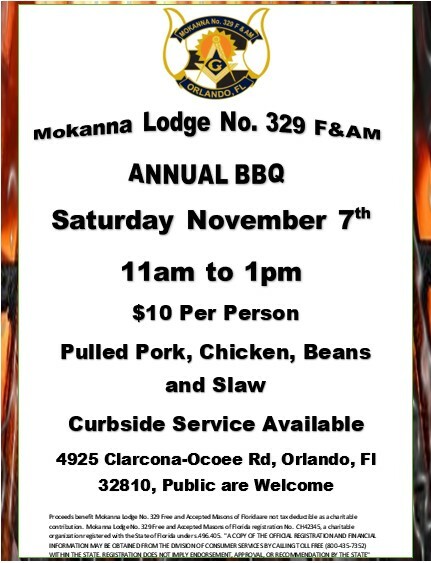 Mokanna is proud and excited to have them as members of our Lodge and look forward to seeing them at our meetings and events! We had a great turnout at our BBQ to support the Russell Home for Atypical Children! Thanks to all who helped and all who attended! We have posted photos of the event on our Facebook page, which can be accessed by clicking here. Before the BBQ, we had a called communication, and our Fellowcrafts: Brothers Clarke Dewitt, Steve Thomas, and Brandon Yates successfully returned their proficiencies! Good job Brothers! Now they are ready for the Master Mason degree at Mokanna on Wednesday, November 7th at 6pm.